If you visit Yahoo and do a search at their web site, you will see that to get to the organic listings, you are going to have to scroll and scroll and scroll. It reminds me of when Ask.com gave up on search and they pretty much filled up their search results with ads at the top and at the bottom they put some organic results. Same with Yahoo, you get five search ads at the top and then some organic listings under it. Of course, you also have ads on the right side of the page. You can search for almost anything on Yahoo Search and get these ads. 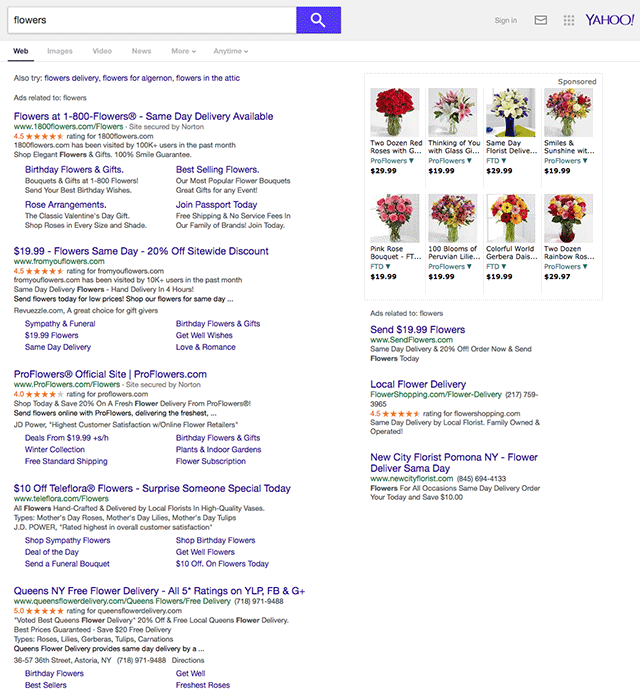 Search for [flowers], [laptops], [SEO] or whatever and you get five ads. Glenn Gabe posted about this on Twitter and wrote "OK, I haven't been to Yahoo for a while. Just tested some searches... and then had to test a few times to make sure. Yep, they are adding *5* ads above the organic listings + no ad labels. Then shopping ads on the right + right sidebar ads. Holy cow. It's Adhoo, not Yahoo."